One of the surprises of the season, Superstore, has been picked up for a second season by NBC. The America Ferrera led comedy has done well for NBC, averaging around 7 million viewers and a 2.1 in the 18-49 demo in Live+7 ratings. UNIVERSAL CITY, Calif. – Feb. 23, 2016 – Attention Cloud 9 shoppers: NBC’s Monday night comedy hit “Superstore” has been renewed for a second season. Season to date, “Superstore” is averaging a 2.1 rating in adults 18-49 and 6.9 million viewers overall in “live plus seven day” results from Nielsen Media Research, making it NBC’s highest rated first-year comedy in two years. So far this season, “Superstore” is topping eight of the 10 other first-year comedies on the Big 4 networks in both adults 18-49 and total viewers. “Superstore” also delivers a solid upscale audience, indexing at a 112 among adults 18-49 living in homes with $100K+ incomes (100 represents an average concentration of those homes, “most current” including L+3). “Superstore,” which has received strong reviews for its laugh-out-loud stories about life behind the scenes of a big box retail megastore, features a cast that has been praised for its on-screen chemistry. 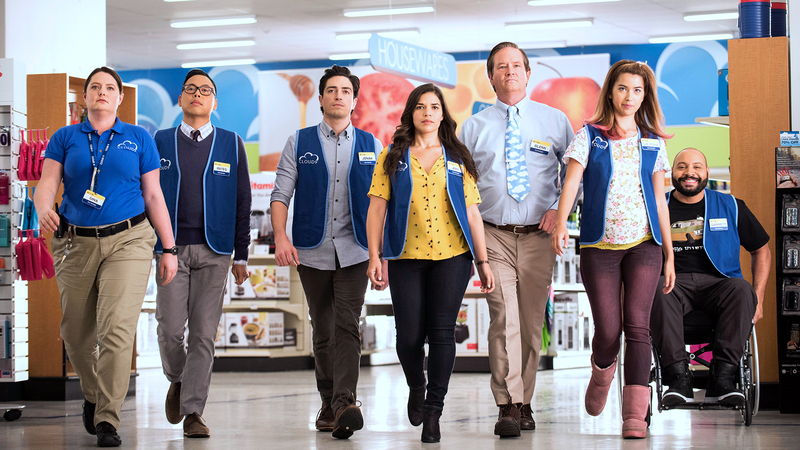 “Superstore” centers around Amy (America Ferrera), the megastore’s most stalwart employee as well as the glue holding the place together, and newly hired Jonah (Ben Feldman), a naive dreamer determined to prove work doesn’t have to be boring. Their fellow associates include the sardonic Garrett (Colton Dunn), the ambitious Mateo (Nico Santos) and the sweet pregnant teenager, Cheyenne (Nichole Bloom). Overseeing them all are Glenn (Mark McKinney), the store’s affable, clueless store manager, and Dina (Lauren Ash), the aggressive assistant manager who lives by a very specific code – namely the store’s employee handbook. From the bright-eyed newbies and the seen-it-all veterans to the clueless summer hires and the in-it-for-life managers, together they hilariously tackle the day-to-day grind of rabid bargain hunters, riot-causing sales and nap-worthy training sessions. “Telenovela” and NBC’s other comedies remain under consideration for next season.